Do your kids need boots for the winter? Here's a chance to win one of two pairs. US only. Enter through 12/3. Good luck. Prize: 2 Winners will receive their choice of style from the 4 pictured above, based on availability. Looking for the perfect gift for the toddler in your life? 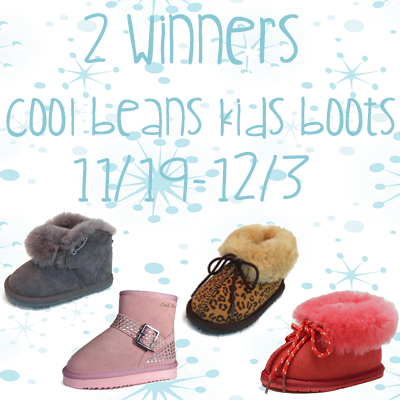 Surprise them with Cool Beans Boots: warm, comfortable, adorable sheepskin footwear that both baby and you will love. CoolBeans Offers Adorable and Trendy Footwear that Both Baby and You Will Love. So Soft and Comfortable – Kids Will Want to Wear Their Shoes All Day! A thick layer of wool guarantees to keep little feet warm and toasty! Enter to win a pair of sheepskin boots, a great addition to your holiday gift list! Cool Beans Footwear Offers Exceptional Quality Genuine Leather Boots and Slippers for Babies, Toddlers and Little Kids at Affordable Prices. It is Important for Children to Have Comfortable Shoes. Footwear Made of Real Leather Naturally Stretches and Flexes, Providing Better Movement for Little Feet, it is Also “Breathable” and Keeps the Feet Dry and Cozy. **Please note the sponsor has requested to receive the email address of each entrant so they can share a 20% off coupon code with you. By entering this giveaway you are granting me permission to share your email address with the sponsor. I like the Cool Beans Genuine Sheepskin Toddler Slippers Baby Winter Boots for Girls Boys (Kids 1-5 years old). $500 Giving Thanks Thanksgiving Giveaway! Organic Skincare Giveaway with Inlight!